The Middle East has been perceived as one of the regions of the world best understood through the lens of the Realist school, which perceives international and regional orders as in an “inescapable” state of war among its major countries. This was somewhat altered in the aftermath of the Arab Spring, when the role of ideas and norms seemed to have impacted politics in the Middle East region, and even influenced the development of the regional order. The perception became dominant for a time that, for the first time in its modern history, a wave of popular democracy had come to the Middle East. Eight years later, amid civil war and regional conflict, any role ideas have played looks rather destructive: sectarian and extremist rhetoric have subverted nation-states, with Iran recreating an imperial order across the Fertile Crescent utilizing the Shiite (or near-Shiite) minorities, while groups like ISIS and Al-Qaeda strive to rebuild the caliphate. Both these versions of extremism sought to dismantle the nation-state, and oppress various religious and ethnic groups in the name of a higher religious loyalty. This has complicated any effort to reach peace in the Middle East since military victories will not suffice in these various conflicts; the extremists’ ideas and ideologies have to be beaten, too. In this chaotic context, the United Arab Emirates perceived the important utility of spreading moderate views to counter the polarizing rhetoric of extremist groups, to prevent them from recruiting people to commit atrocities in the name of Islam, and to prevent Iranian instrumentalization of Shiite minorities. Rejecting extremism and promoting tolerance has been a centerpiece of the UAE policy in the Middle East. Sheikh Zayed bin Sultan Al-Nahyan, the founding father of the United Arab Emirates, emphasized in an interview in 2002 that “Muslims stand against any person of Muslim faith who will try to commit any terror act against a fellow human being”. Sheikh Nahyan bin Mubarak Al-Nahyan, Minister of Tolerance, stated in March 2019, emphasized the continuation of Sheikh Zayed’s policy, that tolerance is “part of the soft power of our country”. Against this background, UAE has promoted several thinktanks that focused on promoting toleration in the Arabic countries. Chief among them is the Forum for Promoting Peace in Muslim Societies, and Hedayah. The Forum specifically focuses on achieving several objectives: reviving the culture of coexistence in the Islamic societies, and its core values, in addition to correcting the wrong ideas promoted by the extremists by using scientific methodology. One of the activities of the forum is the organization of a joint conference with the Ministry of Endowments and Islamic Affairs of the Kingdom of Morocco in 2016, which has resulted in a remarkable and historic agreement known as “Marrakesh Declaration”. The Declaration defends the rights of religious minorities in predominantly Muslim-majority countries. Furthermore, the declaration went on to assure that 2016 marked “the 1,400th anniversary of the Charter of Medina, a constitutional contract between the Prophet Muhammad, God’s peace and blessings be upon him, and the people of Medina, which guaranteed the religious liberty of all, regardless of faith”. The number of participants was remarkable, as hundreds of Muslim scholars and intellectuals from over 120 countries, along with representatives of Islamic and international organizations and leaders from diverse religious groups and nationalities, attended the meeting and issued the declaration. The Forum continued his efforts to spread peace between adherents of different religious groups, as evident in his sponsor of an international conference in Washington D.C. in February 2018 in order to spread the culture of peace. The event witnessed the participation of hundreds of Christian pastors, Jewish rabbis, and Muslim imams. In December, the Forum held the fifth edition in Abu Dhabi for the same purpose, which is spreading peace in the region and worldwide. This declaration represented one of the manifestations of the Emiratis’ multifaceted policy of countering the radicalization and terrorism of organizations like Al-Qaeda and ISIS. It should not be ignored that the UAE actively participated in the global coalition to defeat ISIS in Iraq and Syria, in addition to its participation in fighting Al-Qaeda in Arabian Peninsula (AQAP) in Yemen. More recently, on 5 February 2019, Abu Dhabi hosted Pope Francis, the first-ever trip of the leader of the Roman Catholic Church to the Arabian Peninsula, the birth place of Islam. The Pope celebrated communion with members of the Catholic community in Zayed Sports City. The visit was prearranged to overlap with the Global Conference for Human Fraternity, a dialogue among leaders of the Muslim, Christian, Jewish, Hindu, Buddhist, and Sikh faiths, focused on encouraging peaceful coexistence among communities. During the same visit, Pope Francis and the Grand Imam of Al-Azhar, Ahmed al-Tayeb, announced the Abu Dhabi Declaration — entitled a “Document on Human Fraternity”, which inter alia emphasized the need to “refrain from using the name of God to justify acts of murder, exile, terrorism and oppression”. Al-Tayeb urged countries in the region to view “Christian as partners in the homeland” and perceived as equal citizens, not “minorities”. The constructive Emirati role was captured by Pope Francis himself, who praised the international conference organized by the Forum that was held in Marrakesh in 2016. 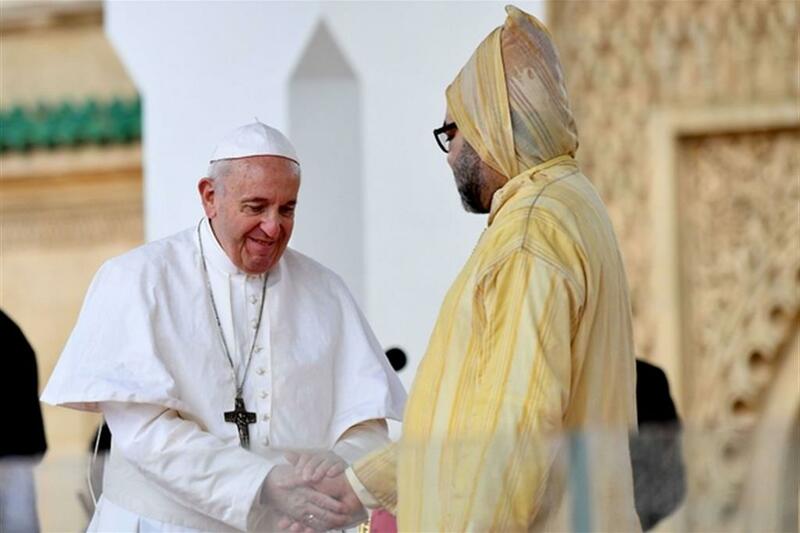 The Pope expressed these comments during his visit to the Hassan Mosque in Rabat, with Morocco’s King Mohammed VI, as part of his historic visit to Morocco. Pope Francis specifically pointed out that “the Marrakesh declaration called for overcoming the concept of religious minority in order to promote the importance of citizenship, and to recognize the value of the human, who should be pivotal to every legal system”. The Pope’s statement, and the Emirati efforts, reveal that they perceive the issue of the minorities in the Middle East in the same way: one that should be resolved within the framework of equal citizenship for all sects, rather than supranational or sectarian identities that lead to subversion of the state or the repression of one group by another. Countering extremist narrative and promoting coexistence between the adherents of different religious is an obvious necessity for Arab societies wracked with years of civil strife and destruction.